WTI Crude soared back to $92.84 per barrel yesterday (January 31, 2011) during the height of the social and political unrest in Egypt. Aside from the negative sentiment that the crisis has brought, traders were also worried that the people’s uprising could interrupt the flow of trade in Suez Canal. Like I said in my previous post (kindly see it here), about 8% to 10% of global sea trade with 1 million to 1.6 million barrels of crude oil per day pass through the canal. Another 3 million or so barrels of crude oil pass through an adjacent pipeline, putting the total to about 4.7% of the global output. Hence, any disruption in the canal could cause a shortage in global oil supply. In fact, some major shipping lines like AP Moller-Maersk had already halted their operations. On the technical side, the price of WTI crude oil had risen sharply from a low of $85.11 per barrel on Friday to a high of $92.84 yesterday. As you can see from its daily chart above, WTI crude oil has been trading within an ascending channel for several months now. From mid-December of 2010, it has started to form a right-angled and descending broadening formation. And from the looks of it, it appears that it is already ripe for an upside breakout. In the event the prices of WTI crude oil move past $92.50, it could further rise and touch the psychological $100.00 marker. On the flip side, it could once again head towards the support of the ascending channel if it fails to break above $92.50. 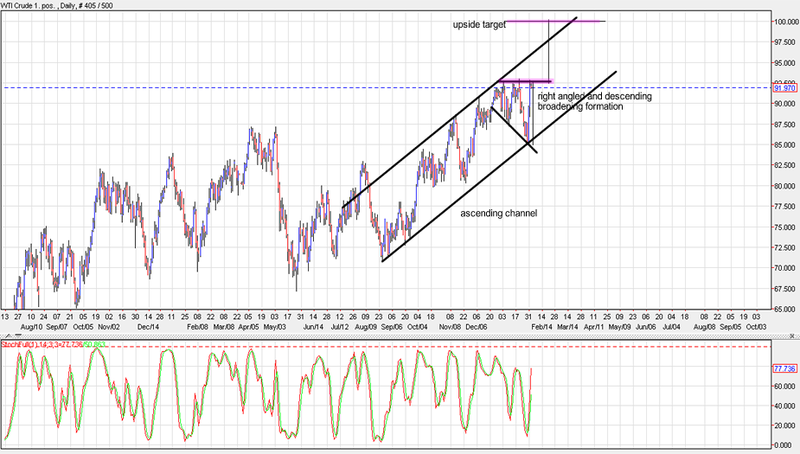 But given the channel’s present direction, the chances that the price of WTI crude oil moving north is higher. Higher crude oil prices could weigh on the equities markets since such makes the cost of running industries more expensive. As you all know, majority of the world’s energy comes from petroleum. While such could negatively impact the global businesses in general, on the one hand, it could also benefit the companies that produce or refine oil especially if they are able to hedge their inventories on lower prices. According to the Commerce Department, we Americans spent more money last month that economists though we would. And that news is sending all three major stock indexes higher today. AUDUSD continued its sideways movement in a range between 0.9803 and 1.0076. Lengthier consolidation in the range is still possible in a couple of days. Key support is at 0.9832, a breakdown below this level could trigger another fall to 0.9600 area. Key resistance is at 1.0076, above this level will indicate that the long term uptrend from 0.8066 (May 25, 2010 low) has resumed, then further rise towards 1.0500 could be seen. Investors this week are likely to focus on the news from Egypt and its effect on the global economic recovery. Good morning, Im Kristin Bianco, with the Week Ahead Market Report for January 31, 2011. This morning, Morgan Stanley lowered its EPS estimates on shares of Citigroup (C) through 2012 as higher costs and lower revenue could impact earnings going forward. In the report, Morgan Stanley maintained its equal weight rating and its $5 price target. The Commerce Department reported consumer spending rose to a seasonally adjusted 0.7% in December, indicating that the economy entered into Q1 with momentum.Income rose 0.4% in December for the second straight month. The savings rate fell to 5.3% in December from 5.5% in November.Economists had expected a 0.4% increase in income and a 0.6% gain in spending. With textbook precision the EUR/USD has completed a 61.8% retracement of the November to January move, but the weekly chart shows a sign of caution. Following the 4Q 2010 decline from 1.4280 to 1.3456, the EUR/USD has climbed as high as 1.3760, a level which coincides with the 61.8% Fibonacci retracement at 1.3744. Since reaching this key technical barrier, the pair has shown a loss of momentum with significant selling occurring at this price. The weekly chart displays a harami cross has formed from the two previous week’s candlesticks, a potential reversal signal in the recent uptrend. Support for the pair comes in at last week’s low of 1.3540 followed by 1.3500, as well as the January 17th low of 1.3250. A breach above the previous week’s high at 1.3750 would be supportive of the pair with further long term resistance located at the mid November high of 1.4080, followed by the October high of 1.4280. The latest Commitments of Traders (COT) report, released on Friday by the Commodity Futures Trading Commission (CFTC), showed that futures speculators added to their short positions of the US dollar against the other major currencies while increasing long positions in favor of the euro. Non-commercial futures positions, those taken by hedge funds and large speculators, were overall net short the US dollar by $18.2 billion against other major currencies as of January 25th. This is a rise from the total short position of $15.06 billion on January 18th, according to the CFTC data and calculations by Reuters which calculates the dollar positions against the euro, British pound, Japanese yen, Australian dollar, Canadian dollar and the Swiss franc. EuroFx: Currency speculators added to their net long positions in the euro against the U.S. dollar with a total of 22,901 long positions as of January 25th. This is a sharp turnaround for euro positions that were long by 4,109 contracts on January 18th and were short by 45,182 contracts on January 11th. The COT report is published every Friday by the Commodity Futures Trading Commission (CFTC) and shows futures positions as of the previous Tuesday. It can be a useful tool for traders to gauge investor sentiment and to look for potential changes in the direction of a currency or commodity. Each currency contract is a quote for that currency directly against the U.S. dollar, where as a net short amount of contracts means that more speculators are betting that currency to fall against the dollar and net long position expect that currency to rise versus the dollar. GBP: Speculators increased their net long British pound sterling positions as of January 25th after turning to net long positions last week. Pound sterling contracts rose to a total of 7,888 long positions after totaling 5,794 long positions as of January 18th. JPY: The Japanese yen net long contracts rose after two declining weeks as of January 25th to a total of 32,218 long contracts. Yen positions had totaled 20,529 net long contracts reported on January 18th. CHF: Swiss franc long positions edged lower for a third straight week to a total of 6,594 long contracts as of January 25th after totaling a net of 6,992 long contracts on January 18th. This marks the lowest level in Swiss franc long positions since July 27th, 2010. CAD: The Canadian dollar positions decreased lower for second consecutive week. CAD long positions registered 31,719 contracts after totaling 44,055 net longs on January 18th. AUD: The Australian dollar long positions dropped lower from the previous week. AUD contracts totaled a net amount of 45,458 long contracts as of January 25th from 53,508 long contracts on January 18th. NZD: New Zealand dollar futures positions decreased to a total of 8,627 long positions as of January 25th. NZD large speculator long positions had advanced the previous week to a total of 11,247 long contracts on January 18th. MXN: Mexican peso long contracts continued to rise for a third consecutive week as of January 25th to 95,245 net long positions after totaling 90,202 longs the week prior on January 18th. The global stock markets were sent crashing last Friday when the political turmoil in Egypt escalated. The major indices in Asia, namely the Nikkei, Topix, and Hang Seng were all in red. The Nikkei slipped by 1.13% to 10,360.30 while the Topix slipped by 1.07% to 919.69. Similarly, Hong Kong’s Hang Seng also fell by 0.68% to 23,617.00. The markets in Europe experienced the same battering with the Stoxx 50 faltering by 1.39% to 2,954.13. Moreover, both FTSE 100 and DAX likewise fell by 1.40% to 5,881.37 and 0.74% to 7,102.80, respectively. In the US, the Dow Jones Industrial Average fell by 1.39% to 11,823.70 while the broader S&P 500 sunk by 1.79% to 1,276.34. The massive sell off even pushed the Nasdaq by 2.48% lower to 2,686.89 which was its worst dropped in 5 months. So what exactly happened in Egypt? Before that, let me first give you a little background on Egypt president, Hosni Mubarak. Muhammad Hosni Sayyid Mubarak or Hosni Mubarak for short is the current and fourth president of the Arab Republic of Egypt. Actually, he has been Egypt’s president for more than 3 decades already since he assumed the position when his predecessor, President Anwar El-Sadat was assassinated back in October 14, 1981. His presiency has been marred with political corruption given his long stay. Recently, he and his administration have once again been the subject of public uprising. Egyptian protesters banged with the police and military as the former pushes for “liberty” and “change,” effectively asking the administration to resign. More than 100 people have already been killed in the protest with about 450 more being arrested as they continue to defy the government’s curfew. Widespread riot and looting have also been prevalent amid the chaos. Just today (January 30), Egyptian President Hosni appointed Omar Suleiman, the country, chief of intelligence as vice president as a sign that the president is becoming ready to leave his post. Still, the public continued to rally and protest in the streets and are expected to do so until he finally vacate the presidency. So what’s all fuzz about Egypt. Well, for one Egypt is the most populous among the Arab nations that borders the Suez Canal. The Suez Canal, in case you do not know, is one of the busiest shipping routes in the world. About 8% of global sea trade with 1 million to 1.6 million barrels of crude oil pass through the canal. Another 3 million or so barrels of crude oil pass through an adjacent pipeline, putting the total to about 4.7% of the global output. Hence, any disruption in disruption like a civil war in Egypt could possibly affect the flow of trade within the region. Moreover, the immediate negative sentiment of the market would lead investors to pull out their money, causing a widespread sell off in the markets. Now, as long as the unrest in Egypt remains, expect a lot of investors to shy away from the markets. On a separate note, the weaker-than-expected US fourth quarter GDP (3.2% versus 3.5%) could further add some selling pressure as soon as the Asian trading opens on Monday. In fact, the week could even start with a downside gap. So if you do not have any open long positions, it’s better to just stay away or even short sell selected issues if you can. Right now I would be very careful since a lot of issues are presently trading just above their major technical supports. As you know, a break of those could send them plummeting. Stay on your toes! A distinct risk-off mood took hold at the Asia open after civil unrest in Egypt escalated over the weekend. Both the dollar and the yen initially found support on safe-haven demand, but sentiment soon steadied when no signs of a further deterioration in the political situation materialised. EURUSD traded 1.3571-1.3615, USDJPY 81.78-82.23. Non-Chinese Asian equities lost ground after the S&P 500 finished -1.79% lower on Friday. The VIX also rose 24% to 20.04, it’s highest close since Dec. 1. WTI crude remains elevated although it has slipped back below $90/bbl at the time of writing. Although US Q4 GDP fell short of consensus expectations, it still managed to accelerate to a +3.2% annualised rate (cons. 3.5%) from a pace of 2.6% in Q3. Our analysts see cause for optimism in the composition too, noting that the private demand component has surged ahead, easily surpassing their expectations. The University of Michigan confidence report came in above consensus at 74.2 (cons. 73.3). Elevated geopolitical tensions will likely continue to lend the dollar some near-term support while, over the medium term, we see further dollar strength coming through as the US recovery accelerates. German Finance Minister Schaeuble gave a relatively upbeat assessment of the current phase of the Eurozone’s sovereign debt crisis. He said he did not expect any further “major shocks”, and predicted the euro would be “stable”. He added the Eurozone would learn lessons from the crisis and “create instruments to defend the whole Eurozone”. France’s Finance Minister Lagarde took a similar view, saying the Eurozone has “turned the corner”. Reuters, citing unnamed sources, said a proposal is being considered to extend the maturity of rescue loans offered to both Greece and Ireland. The timeline allegedly being discussed is 30 years. Greek Prime Minister Papandreou said that Eurozone governments are considering a proposal to allow EU institutions to recapitalize banks. Irish Prime Minister Cowen said he would dissolve parliament on Tuesday and call a general election. Both the upper and lower houses of parliament have now passed the key Finance Bill that gives legal effect to the budget proposals announced in December. Senior Vice Finance Minister Igarashii described the yen as “overvalued” on the basis of “Japan’s price levels and other factors”. He warned that Japan will “take decisive steps if there is speculative, excessive movement” in the exchange rate. Private sector credit growth rose only +0.2% m/m in December (cons. 0.3%), but the annualized figure was in line at +3.4% y/y. Our Australian economics team think this latest data point challenges the notion that the domestic economy is “strong”, and they expect the RBA to lower its near-term GDP and underlying inflation forecasts on Friday. Our analysts still look for the next RBA hike to come in H2. Bank of Canada Governor Carney said that “persistent strength” in the CAD is a threat to Canada’s economic growth. EURUSD BULLISH Resistance at 1.3786 holds while support zone is at 1.3573/41. USDJPY BEARISH Break of 81.85 has exposed 81.61 ahead of 81.23. Resistance at 82.93 Friday’s high. GBPUSD BULLISH Support at 1.5752 holds, focus is on 1.6017 ahead of 1.6059 next. USDCHF BEARISH Pressure on 0.9390, breach of this level would expose 0.9301 key low. Initial resistance is at 0.9523. AUDUSD BEARISH Support zone at 0.9833/04 holds. Near-term resistance is at 1.0022. USDCAD NEUTRAL 1.0067 and 0.9838 mark the near term directional triggers. EURCHF NEUTRAL Pressure builds on initial support 1.2774, near term resistance lies at 1.3002. EURGBP BULLISH Focus is on 0.8672/91 resistance zone. Initial support lies at 0.8529. EURJPY BULLISH Upside potential with resistance at 114.01/94, breach of this zone would expose 115.68 next. Initial support lies at 110.51.